I found yet another mural by the husband & wife team of Shalak & Smoky while wandering down a laneway off Harbord St. It is a really long mural on a narrow lane so I couldn't get it all in one pic so we will see a part today and another part tomorrow. 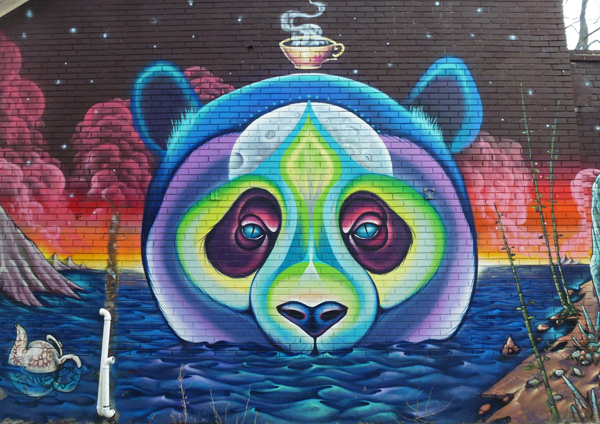 I love the colourful bear with the cup of tea floating above its head but have no idea what it all means! Cute bear and mural. Happy Monday, enjoy your day and new week ahead! Intrigued by the water images and colourful face of the bear. Beautiful mural, I like the strong colors. Maybe it´s a Panda bear and hence he loves eucalyptus-tea? Or maybe not, I agree with Grace, an explanation would be helpful. Lovely mural Pat, love the strong colours. I like it, it's quite colourful. Fine looking mural, but the cup of coffee seems out of place somehow. What do you think? That is mysterious. Not the wall of a tea shop? That bear is adorable with it's big sad eyes. Very nice, so cute, Pat ! If one were to write a child's book or a poem, there is a lot to draw from here!